Nancy Bush is a goddess walking the earth as woman. She is my hero. Well, she is my knitting hero. I mean, it's not like she saved me from a burning building or pulled my baby from an exploding car. She did however, save me from limping, soporific knitting ennui. 10. She wrote Folk Socks. I've been knitting my buddy Ken a pair of socks from this book every Christmas for a while. If you read this book then you will come to love and appreciate the humble sock in a way that you can only imagine now. Socks will take on a meaning so profound that sometimes, when you get dressed in the morning and you go to pull your socks on, you will pause for a moment and think...Thanks Nancy. I swear that after this book you will want to discuss gussets with me. I know that in your wildest dreams you cannot picture yourself finding gussets so interesting that you would want to phone someone long distance and talk only about them, but you will. (We will have to discuss the many and beautiful heel treatments in another call. There will only be time for gussets in the first call). 8. 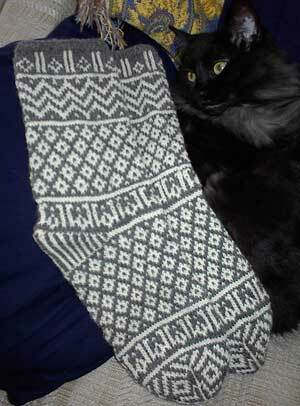 Nancy wrote the pattern for the only sock pattern I have ever happily knit twice. (It is, not coincidentally, the sock above.) Please note that this is not the only sock pattern I have ever knit twice, just the only one that I have knit twice without getting that feeling that comes over you when you turn on the tv and see that "Dirty Dancing" is on for the 900 thousandth time. 7. I have never had to pour myself an alcoholic beverage as a result of an unfortuanate *misunderstanding* with one of her patterns, despite the fact that they are, at times, er... complex. Likewise, I have never emailed her my opinion of an instruction at 3am after trying the alcoholic beverage to resolve the pattern issue first. 6. 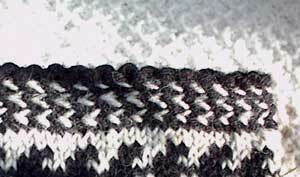 I have never found an error in Folk Socks, and I've knit most of the patterns in the book. This is stunning. This alone is enough to make me think about baking Nancy a cake and writing her name on it. 5. 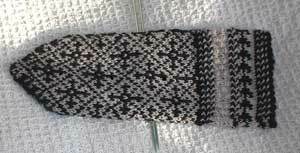 Margene sent me Folk Knitting in Estonia . I had no idea about the Estonians. How did I go this long without knowing how Estonians knit? It's gripping I tell you, gripping. 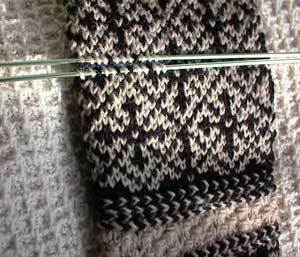 You know that lovely idea that every knitter gets from time to time? You know, about how all over the world knitters are engaged in the same activity, bonded by our common love, all casting on something...united by our common act of knitting? Wrong. The Estonians are not knitting like me. I have nothing in common with them. They are doing a whole other thing. (Well, they were. 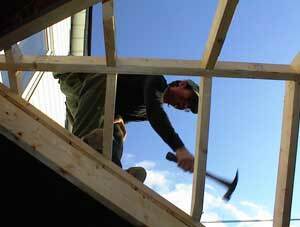 I'm doing it now too...) Check it out. I learned a new decrease, a new cast on, a new braid and a whole new stitch. I swear it. After 30 years of pretty darned adventurous knitting, I learned 4 things that I had never even entertained the concept of. Oh Nancy, you have given me so much. (I'm sure that Joe would also like to thank you for the portion of his evening spent with me showing him mittens and following him around the house explaining a "half-wick increase". I was excited). I'm telling you, Nancy Bush has been trekking around Estonia, learning knitting stuff and writing it down in a way that makes it accessible and interesting to a knitter in Toronto who thought she knew it all. Nancy Bush is a blow to the ego and I like it. 2. Nancy Bush does thumbs like me. Here we have the thumb stitches "held" on waste yarn and I've picked up the stitches above and below before ever so delicately pulling out the waste stitches. I pick them up first because I have never gotten over my fear that when I pull out the waste yarn, something bad will happen. Something really bad. Worse than unravelling. The fact that someone as clever as Nancy Bush does thumbs like me validates my entire thumb approach. I was thinking about other thumb-ways. Not anymore. Anything thumb that's good enough for Nancy is good enough for me. C'mon, think about it. She's been to Estonia and still does it this way? That means something. 1. Nancy has been afforded The Yarn Harlot's highest accolade several times. Not once, not twice...but three times I have knit one of her patterns exactly as written. I have not changed the cast on, I have not mocked her choice of toe. 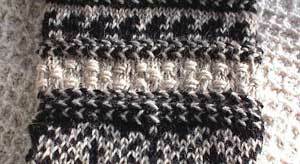 I have not mumbled about the lame decreases and bitterly inserted the superior decrease of my own choosing while adding another centimetre to the ribbing because she has no sense for it.